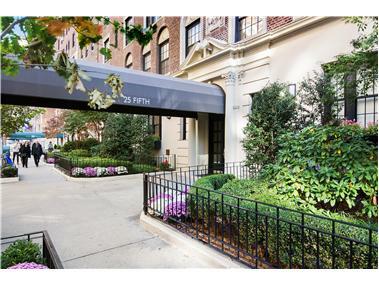 Own your new home in this condominium residence at 25 Fifth Avenue, perfectly positioned in in internationally celebrated, historic Greenwich Village. Building amenities include 24 -hour concierge attended lobby, redesigned and remodeled lobby, upgraded telecommunications capacity, fitness center, laundry facility, bike room and private storage lockers available for purchase. This is a pet friendly building. This is a sponsor unit with windowed gourmet kitchen with top of the line appliances, classically appointed windowed bath featuring white tasso marble and black absolute granite with Kohler fixtures. Pre-war style detail with up to 10' ceilings, solid hardwood floors with walnut accents, pre-wired phone, cable and internet access.